And now that the tech giant is America's first trillion-dollar company, Berkshire Hathaway's 5% stake is worth nearly $50 billion, according to a regulatory filing posted Saturday. That's by far the most valuable stake Berkshire has in any one company. Berkshire made its first play at Apple just over two years ago at a time when investors were wary of the tech giant because of slowing iPhone sales. Berkshire purchased about 10 million shares that were worth a total of $1.1 billion at the time. Berkshire (BRKA) has continued to snap up Apple stock incrementally, and the firm again boosted its stake in Apple (AAPL) during the first quarter of 2018. 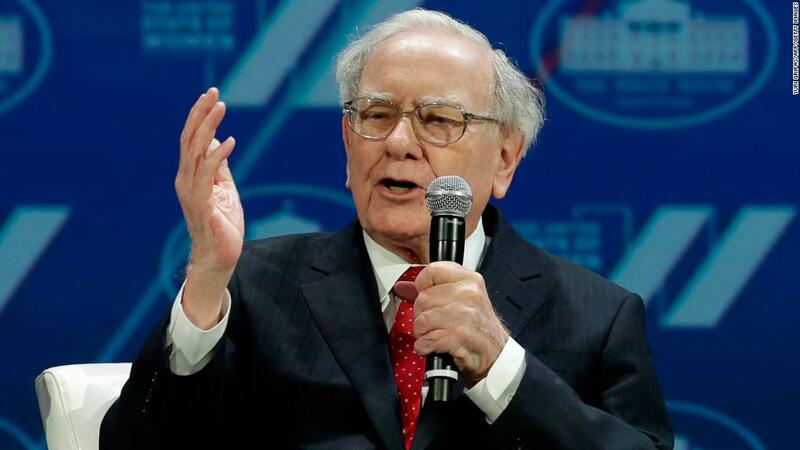 By the end of March, Berkshire owned more than 200 million shares worth about $41 billion. At the end of June, Berkshire's quarterly report showed a $47.2 billion investment in Apple. The endorsement from the Oracle of Omaha has helped propel the tech giant to the first $1 trillion valuation this week. Overall, Berkshire Hathaway's operating profits shot up 67% last quarter, rising to $6.9 billion from $4.1 billion a year earlier. Highlights from Berkshire's latest earnings include a major upswing in its insurance business. In its underwriting sector, operating profits rebound from a $22 million loss to post a $943 million gain. Berkshire operates businesses in the insurance, utility, manufacturing and railroad sectors in addition to its vast investment portfolio. Berkshire also reported net earnings that climbed from $4.3 billion to $12 billion compared to the same quarter last year. But Buffett has repeatedly warned not to focus on net earnings. Because of an accounting rule change that took effect earlier this year, Berkshire had to begin factoring in unrealized gains or losses into its reported net earnings. Buffett wrote in a letter to shareholders earlier this year that the rule change would "severely distort" its net earnings, and cautioned investors to focus on the "truly important numbers that describe our operating performance." Berkshire's stock price is up more than 7% over the past month. In mid-July, the firm made an internal rule change that essentially granted Buffett and Berkshire Vice Chairman Charlie Munger the ability to repurchase company stock whenever they feel like it. That lead many to speculate Berkshire may soon join the stock buyback bonanza corporate America has engaged in lately. —CNN's Paul LaMonica contributed to this report.